Keith Richards is best known for being the guitarist in one of the most famous rock bands in the word, The Rolling Stones. As a child growing up in London, Keith would visit his Grandad Gus and they would go for long walks, exploring their city. One day, while out on one of their walks, Gus and Keith visited a music store and the young boy was transfixed by all of the instruments, in particular the guitars. Back at home, Gus told Keith that when he was tall enough to reach the guitar on top of the piano, he could "have a go." Gus taught Keith how to hold the guitar, strum simple chords, and said that the day he learned how to play Malagueña, he could play anything. Of course, it wasn't long before Keith was impressing his granddad with his talent and passion. Don't miss Keith narrating the story on the accompanying CD, which also includes riffs from Malagueña interspersed throughout the narrative to help set the tone and emotion of the story. 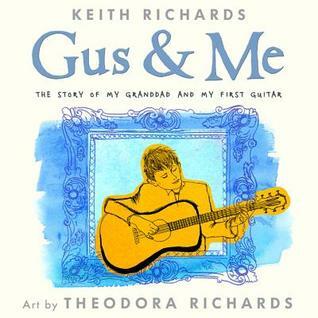 Keith's daughter Theodora, named after her great grandfather Gus (Theodore Augustus Dupree), consulted her father and dug through family photos to create the pen and ink illustrations in Gus and Me, which I believe would be a perfect book to give a young budding musician, especially one where musical passions have been passed down and nurtured in his or her family.